Have I ever told you that my five year old - The Evil Genius/Death Wish - has a thing for oysters? Raw oysters. And preferably the East Coast varieties. She tried them once when we were out for brunch. Hubby and I were sharing a dozen so we doled a bite out to the girls. The One Bite rule, right? They were both rather meh about them so we didn't think anything of it. Another trip to the same brunch spot a month or so later and she asked for one more. We're generous folks and don't mind sharing, especially with the kids, but before I had a chance to have my second oyster she'd had 6! From there she went straight to eating dozens, literally, at a time. Taking her out for dinner or brunch is getting expensive! So when I saw this book on the shelf at Anthropologie, of all places, I had to grab it. Purely for parental research, you know? Shucked: Life on a New England Oyster Farm is the personal story of a food and lifestyle writer in Boston. 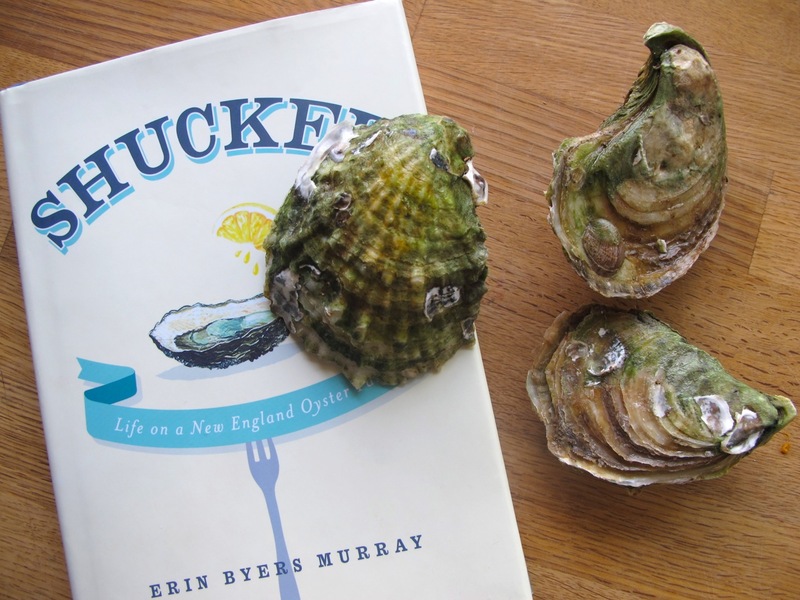 Erin Byers Murray is feeling jaded and bored and without too much thought decides to take a year off and work on an oyster farm. She describes her brutal, cold first days - cleaning and culling just harvested oysters on the frozen Duxbury Bay, Massachusetts. Then summer comes and the work is backbreaking but thrilling. There are the challenges to her marriage with her now an oyster farmer at the mercy of the tides and her husband the bartender. There are also the highs of food festivals and post work beers and new relationships. Behind all that is the story of an oyster from seed to table. Not to mention all the farmers who make it happen. My five year old is too young to read this book just yet, but I'll be keeping it on the shelf for her. And I predict she'll read it round about the time she starts paying for her own oysters. We just came back from Spain where my (then 9 year old) son ate plates of mixed fish, mussels, prawns, cuttlefish, squid, octopus, whole sardines etc. He loved it and can't wait to go again. Your daughter obviously inherited her good taste from you! My 5 year old eats so much sushi, that we don't go anymore. It's just too expensive. She started with California rolls and now she just eats straight sashimi. I am a pretty adventurous eater...but oysters are just one of those....eeeewwww. LOL I do however understand the expensive eater! My son loves crab legs and craw fish and lobster!